The Basilica Cistern (Turkish: Yerebatan Sarnıcı – "Cistern Sinking Into Ground"), is the largest of several hundred ancient cisterns that lie beneath the city of Istanbul (formerly Constantinople), Turkey. The cistern, located 150 metres (490 ft) southwest of the Hagia Sophia on the historical peninsula of Sarayburnu, was built in the 6th century during the reign of Byzantine Emperor Justinian I. Today it is kept with little water, for public access inside the space. This subterranean cistern, in Greek kinsterne (κινστέρνη), was called Basilica because it was located under a large public square on the First Hill of Constantinople, the Stoa Basilica. At this location, and prior to constructing the cistern, a great Basilica stood in its place, built between the 3rd and 4th centuries during the Early Roman Age as a commercial, legal and artistic centre. The basilica was reconstructed by Illus after a fire in 476. The enlarged cistern provided a water filtration system for the Great Palace of Constantinople and other buildings on the First Hill, and continued to provide water to the Topkapı Palace after the Ottoman conquest in 1453 and into modern times. This cathedral-size cistern is an underground chamber approximately 138 metres (453 ft) by 65 metres (213 ft) – about 9,800 square metres (105,000 sq ft) in area – capable of holding 80,000 cubic metres (2,800,000 cu ft) of water. The ceiling is supported by a forest of 336 marble columns, each 9 metres (30 ft) high, arranged in 12 rows of 28 columns each spaced 5 metres (16 ft) apart. The capitals of the columns are mainly Ionic and Corinthian styles, with the exception of a few Doric style with no engravings. One of the columns is engraved with raised pictures of a Hen's Eye, slanted braches, and tears. This column resembles the columns of the Triumphal Arch of Theodosius I from the 4th century (AD 379–395), erected in the 'Forum Tauri' Square. Ancient texts suggest that the tears on the column pay tribute to the hundreds of slaves who died during the construction of the Basilica Cistern. The majority of the columns in the cistern appear to have been recycled from the ruins of older buildings (a process called 'spoliation'), likely brought to Constantinople from various parts of the empire, together with those that were used in the construction of Hagia Sophia. They are carved and engraved out of various types of marble and granite. Fifty-two stone steps descend into the entrance of the cistern. The cistern is surrounded by a firebrick wall with a thickness of 4 metres (13 ft) and coated with a waterproofing mortar. The Basilica Cistern's water came from the Eğrikapı Water Distribution Center in the Belgrade Forest, which lie 19 kilometres (12 mi) north of the city. It traveled through the 971-metre-long (3,186 ft) Valens (Bozdoğan) Aqueduct, and the 115-metre-long (377 ft) Mağlova Aqueduct, which was built by the Emperor Justinian. 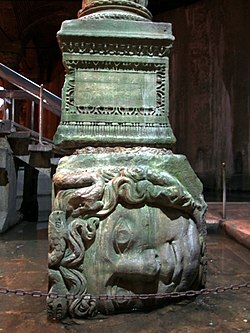 Located in the northwest corner of the cistern, the bases of two columns reuse blocks carved with the visage of Medusa. The origin of the two heads is unknown, though it is thought that the heads were brought to the cistern after being removed from a building of the late Roman period. There is no written evidence that suggests they were used as column pedestals previously. Tradition has it that the blocks are oriented sideways and inverted in order to negate the power of the Gorgons' gaze; however, it is widely thought that one was placed sideways only to be the proper size to support the column. The upside-down Medusa was placed that way specifically because she would be the same height right side up. The cistern was used as a location for the 1963 James Bond film From Russia with Love. In the film, it is referred to as being constructed by the Emperor Constantine, with no reference to Justinian, and is located under the Soviet consulate. 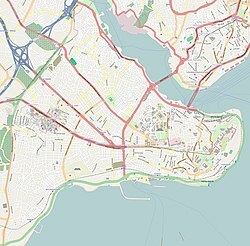 Its real-life location is a considerable distance from the former Soviet (now Russian) consulate, which is in Beyoğlu, the "newer" European section of Istanbul, on the other side of the Golden Horn. In 1969 the cistern was used as a setting in Pawn in Frankincense, the fourth of the Lymond Chronicles books by Dorothy Dunnett. The cistern is featured in Clive and Dirk Cussler's 2010 Dirk Pitt fiction novel, Crescent Dawn and The Navigator. In the 2011 video game, Assassin's Creed: Revelations, the player controlled character, Ezio Auditore, is given the chance to explore a section of this cistern in a memory sequence entitled The Yerebatan Cistern. The cistern is also featured in Jean-Baptiste Andrea's film thriller Brotherhood of Tears (2013). In the sequence, the lead character, acting as a transporter (played by Jeremie Renier), delivers a suitcase to a mysterious client (played by Turkish actor Ali Pinar). The cistern with its inverted Medusa pillar featured in the 2013 Dan Brown novel Inferno (as well as its 2016 film adaptation). In the young adult Marvel novel Black Widow: Forever Red by Margaret Stohl, published in October 2015, the climactic scenes take place in the cistern and in a secret lab hidden behind it. In the historical novel Eight Pointed Cross by Maltese-Canadian Author Marthese Fenech, the cistern is featured is scenes set in 16th century Istanbul. Art exhibit in the Cistern, 2010. ^ a b c d e f "YEREBATAN SARNICI". ^ a b Planet, Lonely. "Basilica Cistern - Lonely Planet". ^ "Memory 6 - The Yerebatan Cistern". IGN. Ziff Davis, LLC. 24 December 2011. Retrieved 30 May 2018. ^ Totilo, Stephen (14 September 2011). "See The Real Places You'll Go in the Next Assassin's Creed". Kotaku. Gizmodo Media Group. Retrieved 30 May 2018. ^ Guillet, Marc (5 May 2015). "Dan Brown draws visitors Basilica Cistern". Enjoy Istanbul. Retrieved 30 May 2018. ^ "Istanbul's Basilica Cistern on silver screen with 'Inferno'". Hurriyet Daily News. Muro Media. 12 October 2016. Retrieved 30 May 2018.